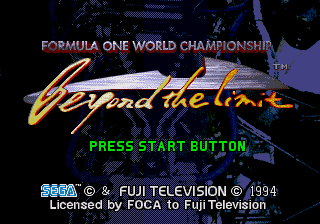 Formula One World Championship: Beyond the Limit, known as Heavenly Symphony: Formula One World Championship 1993 (ヘブンリー シンフォニー フォーミュラーワン ワールド チャンピオンシップ 1993) in Japan, is a Formula One racing game for the Sega Mega-CD. It was produced by Sega in co-operation with Fuji Television and is licensed by FOCA. Though it shares many similarities with Sega's prior Formula One racing games, specifically Super Monaco GP and Ayrton Senna's Super Monaco GP II, it is thought to be produced by an entirely different team within Sega, so is not considered a sequel. Ironically Ayrton Senna is omitted from this game's lineup for licensing reasons, and is therefore the only missing driver from the 1993 Formula One season (although his name and car number can be defined by the player). The game takes place in a first person view from the cockpit, like many racing games on the early era consoles, but instead of using pre-defined road pieces or background deformation, this game makes use of the Sega Mega-CD's extra hardware and uses scaling and rotation of an image, similar to the Super Nintendo's Mode 7. This effect is also used in Sonic CD's Special Stages and various other games. All 16 tracks are available from the 1993 season, including the fictional Sega Park, given the location of Japan. The tracks themselves are accurate recreations of the real tracks, with appropriate elements from their real-life counter-part. For example, Donington Park, which was sponsored by SEGA, had various SEGA logos littered all over the place (with various billboards of Sonic the Hedgehog). Like most racing games, this features a main Grand Prix mode, where you take the reins and take the 1993 season on. You will start off on the Sega Park test track, in a very generic car. From your performance, you will be able to select a team to drive for and make your contract. Based on how the player does during the season, they can either get new contract offers, or get fired from their current team. There are 4 save files to use for this mode, the player can do the season as various teams, or to be allowed for a friend's save. There is also a 1993 Mode, allowing the player to take on challenges based off events in the 1993 season. For example, for the European Grand Prix, the player must take the role of Rubens Barrichello for 6 laps on Donington Park. The rain is at play and drivers are constantly pitting in with the changing weather. Rubens' tires are wearing out, and the player must pit, retain position, and don't let the Williams driver, Damon Hill, overtake Rubens. Upon selecting a scenario, a FMV will play showcasing a bit of the race's events, then transition into the gameplay. There are also another 4 saves for this mode. Finally, there is a Free Run mode, where the player can drive on any track, with any amount of laps, any car of their choice, and the choice of weather. This game controversially uses Tobacco Sponsoring. While it was standard practise for other racing games to avoid this, it would seem to be complete ignorance by the Japanese developers, despite being under supervision of FOCA and Fuji Television. Various sponsors, while visible in the cutscenes, are visible on cars and the track - Player's LTEE, for example, on the Canadian Grand Prix, and Camel on the Benneton. The game was made notably more easy for the localised release. The Japanese release, for example, is slower, and engine failure is a much higher possibility. Additionally, use of the boost for longer than one lap would cause an engine failure, in accordance to one of the texts in the game. Instead, it would take around 4 laps in the exported version. The heads-up-display was moved to the bottom of the screen in the localised release, whereas it was on the top in Japan. Various songs were given different usages between versions. In 1993 mode, the Japanese release had music playing while racing, which went unused in the exported game. A bonus menu could be accessed when the player won the Driver's Championship and the Constructors Championship, giving access to all the FMVs in the game. This was not in the Japanese version. Main article: Formula One World Championship: Beyond the Limit/Magazine articles.